It’s time to move! You started hunting for boxes but are stuck wondering just how many boxes do I need to move and where exactly can I find packing boxes? While there’s no hard and fast rule, you can estimate how many moving boxes you need by looking at your home and its contents. Don’t get stuck unable to pack up your books or waste your money on extra boxes you don't need. Instead, follow this breakdown of how many packing boxes you need to move and save yourself the struggle. Determining how many packing boxes you need can be a complicated task. You might live in a one bedroom apartment but have a baby and plenty to pack. On the flip side, a couple could live in a 2,000 square foot house and only have minimal belongings. In general, a family of four will have more belongings than a single person. When asking yourself, “how many boxes do I need to move?” first consider how many people live in your home. People generally gather things over the years. After collecting all of these items, a family probably won’t do a deep purge and empty out their closets if they don’t have to move homes. What is your lifestyle - minimalist, average, or packrat? To clarify, we aren’t talking mattress on the floor minimalism or pizza boxes stacked to the ceiling hoarding. But everyone has a threshold for how much stuff they can handle in their home. Bedrooms are the best rooms to count when asking yourself, “how many boxes do I need to move?” They’re common to almost every home and contain both clothes and personal belongings. A larger home will usually have more items, making square footage an important factor in determining how many packing boxes you’ll need. These little boxes can generally hold about 20 magazines or 6 wine bottles. They’re great for small heavy items like books or all those cleaning supplies. For items that require a little more space, medium boxes are the way to go. You’ll likely have the most of these, so prepare to stock up. In general, they can hold 5-15 cans and boxes of non-perishables, making them ideal for packing up your pantry. Large boxes are the perfect sized packing box for moving your shoes and folded clothes. They can typically hold up to 12 pairs of shoes, so if walk-in closets are the pearl of your home, large packing boxes will come in handy. Since they’re the biggest, it’s a good idea to use extra-large packing boxes for your lightest belongings. Awkwardly shaped items such as toys can be sandwiched between a couple of blankets, protecting them on the move. It’s easy to get carried away though, so try your best not to make these boxes too heavy. These are small, strong boxes made just for packing books. They tend to be 12”x12” so they can hold most sized books and you don’t have to worry about over packing them. 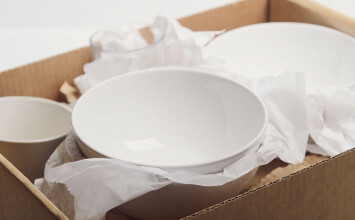 You can feel safe packing your dishes in these specially made boxes. Their extra-thick walls help to absorb shock and reinforce the sides, keeping your grandmother’s china safe. Given their elongated shape and the built-in hanging rod, these are the absolute best boxes to move your hanging clothes in. They’re available in 3 different sizes, so be sure to check the boxes’ dimensions before ordering. How many boxes do I need to move based on square footage? How many packing boxes do I need for my lifestyle? You’re a deliberate decorator who only shows off the items you really care about. Your desire to keep things simple and your appliances multifunctional will come in handy as you pack. You’re probably going to need the fewest number of boxes in each category with more medium boxes and fewer wardrobe boxes. You might be more inclined than others to keep sentimental items like birthday cards and notebooks. Your walls are lined with pictures and every surface is dancing with knickknacks. You’re going to have more belongings than someone less attached to these items so prepare to be on the higher end of our box estimates, especially with small and wardrobe boxes. If neither one of these sounds like you, don’t worry. There’s a whole sliding scale between the two. Wherever you lie, from hoarder to minimalist, take stock of your belongings and you’ll get a good idea of how many boxes you need to move. Don’t have any fine china but have 50 pairs of shoes? Lower your number of dish barrel boxes and up the number of large packing boxes on your shopping list. How many boxes do I need to move by my number of rooms? Kitchen: The average American kitchen is 160 square feet. To pack up a kitchen of this size you’ll need 2-4 small boxes, 5-6 medium boxes, 4 large boxes, 2 extra-large boxes, and 4-6 dish barrel boxes. Living room: Unless your living room doubles as a library or museum, it should be fairly easy to pack up. You’ll want 2-4 small boxes, 3-4 medium boxes, 2-4 large boxes, and 1-2 extra-large boxes. Dining room: Do you store your fine dishes in the dining room? Make sure they’re protected in dish barrel boxes. For the whole room, you should have 1-2 small packing boxes, 1-2 medium boxes, and 2-4 dish barrel boxes. Master bedroom: Of all the bedrooms, your master will likely require the most boxes. Be prepared with 1-3 small boxes, 5-6 medium boxes, 5-8 large boxes, and 4-6 wardrobe boxes. The size of your closet also affects how many boxes you need to move your bedroom, so adjust the number of boxes to fit your clothes. All other bedrooms: These numbers fluctuate depending on whose room it is. Your teenage daughter, for instance, will likely have more hanging clothes than your three-year-old. In general, you should have 1-2 small boxes, 3-5 medium boxes, 3-5 extra-large boxes, and 2-4 wardrobe boxes. Bathroom: Depending on your bathroom, you may only need 2-3 small boxes and one medium packing box. Also remember to buy moving boxes for anything you’re taking from the basement, attic, laundry room, and garage. You don’t want to rush out last minute for packing boxes to carry your tools and camping supplies. How many packing boxes do I need for my home type? What packing supplies do I need to move? This is something you really don’t want to run out of when packing boxes. Tape rolls are 54-110 yards long. This sounds like a lot, but if you’re taping the top and bottom of every box you’ll quickly fly through it. To be safe, have one roll of tape for every 30-60 boxes and always splurge for the dispenser. Trust us, it’ll be worth it. Do you have two sets of dishes and a bar’s worth of glassware? If so, you’ll want 14 lbs of paper and 80 feet of bubble wrap to protect your breakables. At a minimum, we recommend purchasing 3 lbs of packing paper and 20 feet of bubble wrap. For easy labeling, markers are a must. 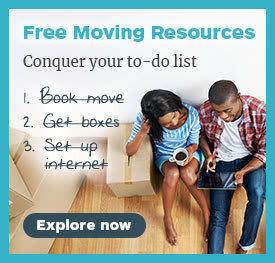 Luckily, they’re useful for more than just moving day, so you can never really have too many. For packing, however, be sure to have 1-4 markers on hand. This is especially important if you’re friends and family help you pack. Passing the marker back and forth is fun, but having your own is better. Make sure you have at least one label for each box. We recommend using two, that way you have more than one side covered when it comes time to unload. Want to get the most out of your labeling? Choose colored labels and use a different one for each room. This way you won’t waste time reading the labels until you’re unpacking each box. Moving is easier when you have fewer things, so donate your clothes and hold a garage sale to offload anything that you don’t need. Uncover a shirt you haven’t seen in years? Chances are you won’t miss it so pass the shirt along to someone who’ll get good use out of it. 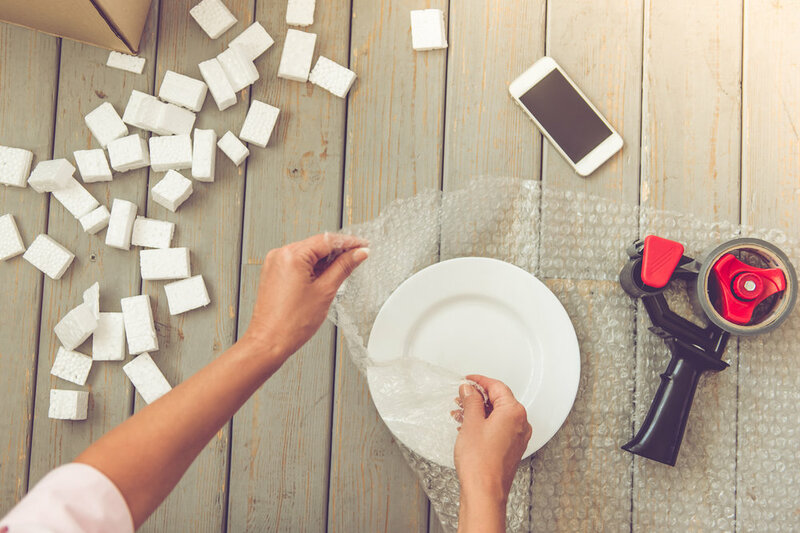 Knowing how to successfully pack your jewelry and safely transport your fragile items will save you time and frustration before you move. When it comes times to move the electronics, take pictures of all chords before unplugging them and use plastic baggies to keep them safe. 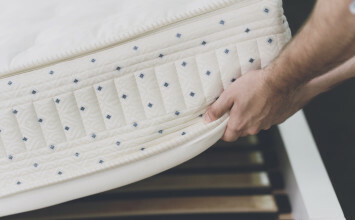 Want the first night in your new home to be comfortable? We thought so. Make life easy on yourself and pack an open first box. Pack this box with enough essentials to get you through the first 48 hours in your new home. 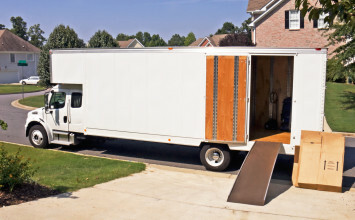 Make sure to include any important documents not suitable for traveling on the moving truck. Packing boxes is an essential part of moving. With this guide and a little extra organization, you can answer the question, “how many boxes do I need to move?” in no time. Here’s to having all the boxes you need for a successful move! More of a visual person? Download or print our handy Moving Box Estimator Worksheet! Fill it out and keep it on hand when you’re shopping for moving boxes.